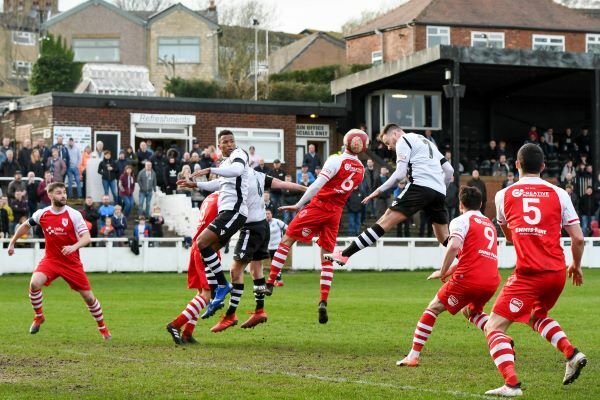 With both sides fighting for a place in the end of season promotion play offs, Mossley and Colne played out a goalless draw at Seel Park on Saturday. In a game of very few incidents the main talking point of the first half was the performance of referee Mr Porter who showed seven yellow cards before the interval even though there was barely a foul that merited such a reaction. It was a tense game with neither side prepared to give an inch and in the cancelling each other out with defences very much on top. Colne wide men Reece Jebb-Foster and Bradley Lynch were a threat to Mossley throughout with Jebb-Foster having all Colne’s best efforts but Josh Ollerenshaw was able to deal effectively with the few half chances the visitors could muster. At the other end Mossley struggled to create anything meaningful but Ben Halfacre saw his attempted lob fielded by Hakan Burrton and Max Leonard who took a high cross brilliantly was unlucky to see his effort blocked. Colne manager Steve Cunningham would have been the happier at half time as his in form team had looked the better side in the opening 45 minutes. However, it was Mossley who went on to control the second half. Adam Jones flashed a diving header narrowly over the bar, Max Leonard saw his far post effort from a narrow angle turned away for a corner and a great run by Andy Keogh saw the Mossley skipper fire high and wide after opening up the space. The best chance of the game fell to Max Leonard who’s powerful goal-bound header was brilliantly saved by Burton. In the last minute Keogh’s deflected cross was turned over the bar by Leonard unaware that Adam Jones was waiting for a simple tap in behind him and the blank score-line was confirmed.